Is there no way of completing this collection I have everything else done but these 2 items and have not had a drop from a crate etc in months. Is there no way of completing this coll﻿ection I have everything else done but these 2 items and have not had a drop from a crate etc in months. Crate? Do you mean containers? If you want to collect more items, you can buy the '3 years of world of warships' in the arsenal. It cost 5000 coal each. I only see "two years of wows", or "battle of north cape". I have also been patiently waiting. I assumed it would update with the new year. That would be the 2 years ones, not 3 years. There are also Dunkirk, North Cape, Bismarck and Vive la France, but not the 3 years Anni. 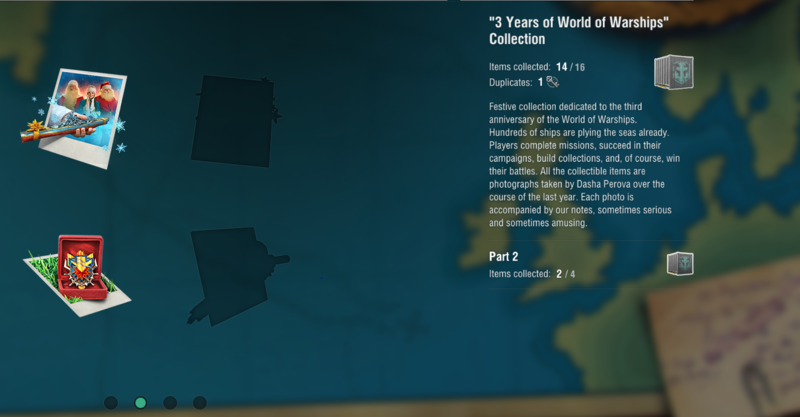 Yea sorry containers not crates but they do not drop the collection items anywhere for the 3 year ones .. I need 2 more to complete everything its very frustrating not to be able to complete it all .. It took them roughly a year to add North Cape containers (New Year 2018)... It will take 6-12 months to add 3 years Anni Containers.